This page provides information about accessibility testing tools that can be helpful in detecting accessibility concerns on websites and web applications. We recommend you test against both Section 508 and WCAG 2.0 to ensure long-term conformance with accessibility guidelines and create the best experience for users of the site or application. Single page and site evaluation tools. Deque’s aXe (the Accessibility Engine) – an open source Chrome extension and Firefox add-on to test webpages for accessibility issues. For a complete list of Web Evaluation checkers, explore the Web Accessibility Evaluation Tools List provided by W3C’s Web Accessibility Initiative. For information on how to check PDFs and other types of electronic documents, please visit our Creating Accessible Documents page. 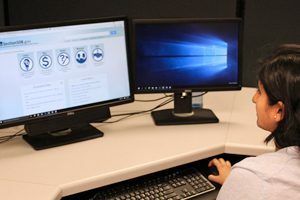 The Web accessibility evaluation checkers listed above can perform automated testing of the web pages and provides information about whether the accessibility guidelines are met and reports the issues. Automated testing needs to be combined with manual testing to complete the process for accessibility checking. Screen readers are programs used by people with visual impairments that provide an auditory representation of what is on the screen. Testing with a screen reader can help achieve manual testing. JAWS screen reader (free download) – Job Access With Speech (JAWS) is a commonly used robust screen reader for Microsoft’s Windows and has a free demo mode. To perform testing of web pages use Internet Explorer and Firefox. To get started, we recommend WebAIM’s Using JAWS to Evaluate Web Accessibility guide and Deque’s JAWS Quick Reference Guide. NDVA screen reader (free download) – NonVisual Desktop Access (NVDA) is a free, open source screen reader for Microsoft’s Windows. To get started, we recommend WebAIM’s Using NVDA to Evaluate Web Accessibility guide and Deque’s NVDA Quick Reference Guide. VoiceOver screen reader – VoiceOver screen reader is built in the MacOS and iOS. Testing should be conducted using Safari. To get started, we recommend WebAIM’s Using VoiceOver to Evaluate Web Accessibility guide and Deque’s Quick Reference Guide. Visit our webpage Creating Accessibility Documents to learn more about document accessibility. Our team can provide an accessibility evaluation of MU websites or web applications, and assist with how to create accessible web technologies. To request our services, complete the Web Accessibility Services request form.